Rainwater harvesting (RWH) for recharge augmentation is among the major activities being taken by the Central Ground Water Board for the effective implementation of demonstrative schemes. With the exponentially increasing demand of water resources due to escalating population, the city beautiful“Chandigarh”, has also implicated the scheme at the remarkable speed in a very short span of time. The rainwater harvesting potential of Chandigarh, with an area of 114 sq km and the average annual rainfall of 1059.3, is calculated to be 60380.1million litres or 13241 gallons or 36.28 MGD. Thus, the potential is more than the water pumped out of aquifers and therefore, efficient harvesting of rainwater and proper recharging of groundwater will go a long way in contributing towards sustainability of water supply. Scheme of rooftop rainwater harvesting at CSIO Complex, Chandigarh (1998-99). Artificial recharge to ground water under central Sector scheme in Panjab University, Chandigarh (2000-2001). Artificial recharge to ground water in Leisure valley, Chandigarh (2000-2001). 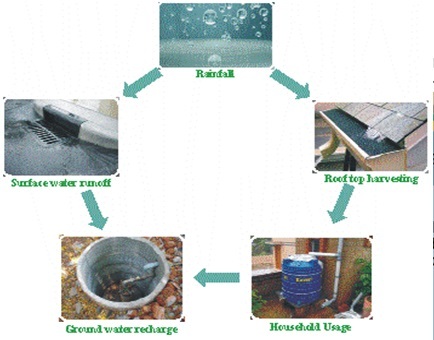 Scheme for roof top rainwater harvesting at Bhu-Jal Bhawan Chandigarh (2001-2002). Artificial recharge to ground water at office of Chandigarh Housing Board in sector 9, Chandigarh (2001-2002). Scheme for rain water harvesting at DAV School in Sector-8, Chandigarh (2001-2002). Scheme for utilising surplus water monsoon runoff for sector 27,19,30,20, Chandigarh (2001-2002). To reduce dependence on ground water a short term legal framework has been laid by the Administration to make provisions for rainwater harvesting mandatory while granting the additional covered area to all plots above 500 m2 areas. Under the JNNURM, the MCC has already set in motion a process to treat and reuse sewage water for horticultural purposes. Chandigarh is unique because it has huge demand for water for horticulture purposes. The total water demand for horticulture purposes is 20 MGD. To reduce its pressure for fresh water, a tertiary treatment (TT) plant was set up in Diggian in 1991. Distribution system has been laid to distribute this treated water for the green areas in Sectors 1-12 and Sector 26. At present 7 MGD of TT water is being distributed through pipe lines to green areas in Sectors 1-12 and Sector 26. In order to conserve the fresh water, tertiary treated water could be used for irrigation purposes for gardens, green belts etc. A project Tertiary Water Supply for irrigation of green belts in Chandigarh City was conceived in the late 80's & the first 10 MGD Tertiary Treatment Plant for treating sewage already treated up to secondary level to Tertiary level was commissioned in year 1991. Under this project, Prestressed Pipes (PSC) was laid from STP at Diggian (Phase XI, Mohali) to Rajindra Park, Sector -1 Chandigarh for carrying Tertiary Treated water to City for irrigation of gardens, green belts & lawns. Along with this skeleton distribution network for supplying Tertiary treated water to multi kanal houses in about 10 Sectors was laid. Initially, the requirement of the water in these Sectors was limited to 3 to 5 MGD as limited pipe network was laid. In order to utilize 10 MGD capacity of Tertiary treated water, a 2nd Project for Tertiary Treated Water Supply line was aged and executed in the year 2005 and the same was completed in the year 2007.